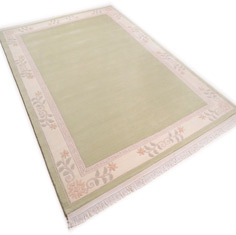 Classica rugs, a superior quality plain centre rug with a floral border. The sublte design and warm harmonious colours combine to make a gorgeous floor covering. Classica is hand-knotted in Nepal, only pure new wool from New Zealand is used in the weaving process. This high density range will give many years of use, the design is timeless and full of texture and character. Available in beige, green and rose pink.